A dog in China has shown why he should never be behind the wheel, by somehow crashing his owner’s pedicab into a phone store. The strange incident, which occurred in the city of Taixing, was captured by CCTV cameras inside the store. 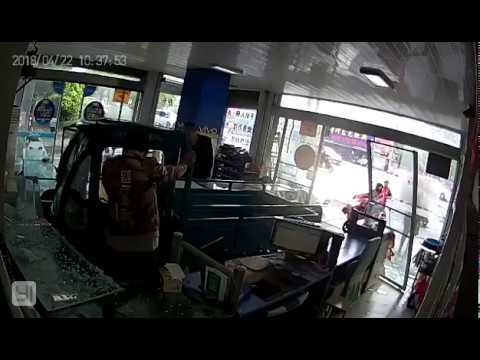 It shows the vehicle slamming through the front door and crashing into a display counter, sending glass all over the place in the process. At first, it seems the pedicab has no driver before a dog’s silhouette appears mysteriously in the driver's cabin. According to local reports, the animal climbed into the car while its owner, who owns a nearby grocery store, left the engine running. Incredibly, no one was injured in the accident, and it is believed that the dog also escaped an injury. The owner of the grocery store, seen in the video pushing the pedicab out of the store, has apologized for the damage and is expected to pay for the damage. DoglopedixA dog in China has shown why he should never be behind the wheel, by somehow crashing his owner’s pedicab into a phone store.